Venn Johns, Tulsa’s own bull riding ninja and owner of BA Ninja Warrior Gym, is one of the top professional bull riders in the world with the Professional Bull Riders (PBR) organization and an official American Ninja Warrior (ANW) featured in ANW Season 9 and the upcoming ANW Season 10. Johns, in partnership with Rodeo Wrecks, Cowboy Lifestyle Network and Prevent Bullying Tulsa, is working to eradicate bullying in the Tulsa area. To kick off this effort, the group will be offering fans a chance to purchase raffle tickets to own one of Venn Johns’ own Harley Davidson motorcycles, with Venn’s autograph and official “Vennmmm” logo! The 2015 Radioactive Green bike is a must have for all motorcycle enthusiasts and YOU could be the proud new owner! The lucky recipient will also receive a commemorative, one of a kind Venn Johns “Vennmmm” branded T-shirt featuring Rodeo Wrecks, Cowboy LifeStyle Network and Prevent Bullying Tulsa and an autographed Venn Johns poster! A portion of the proceeds will benefit Prevent Bullying Tulsa. Prevent Bullying Tulsa is a project of The Parent Child Center of Tulsa with 30 partners including education, mental-health, non-profit, advocacy and parent groups working to promote a safe, civil, and respectful community by preventing bullying among children, youth, and adults. The motorcycle will be on display at BA Ninja Warrior gym on Wednesday, May 30 th for the BA Ninja Warrior Gym’s ANW Season 10 Premier Night watch party. The premier event is slated for 7:00 p.m. at BA Ninja Warrior Gym in Broken Arrow and will be showing of the ANW Season 10 premier, featuring Venn Johns. Admission is only $5. For BA Ninja Warrior Gym members who bring a non-member guest, admission is free. Other BA Ninja Warrior Gym amenities will also be raffled throughout the evening. Fans will also have an opportunity to meet THE Bull Riding Ninja and get autographs and photos as well. 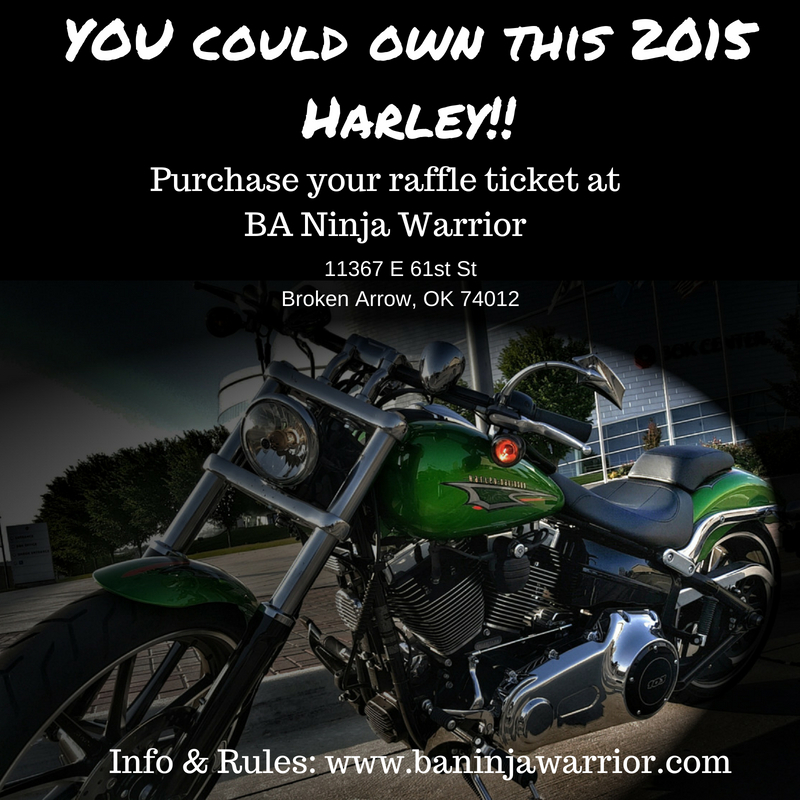 Purchase tickets for the raffle at BA Ninja Warrior in Broken Arrow (11367 E. 61st St. Broken Arrow, OK 74012). For official rules click here. Raffle tickets are $100 per-ticket or $400 for five raffle tickets. Space is limited so secure your BA Ninja Warrior Gym’s ANW Season 10 Premier Night watch party event admission now! Register online at BANinjaWarrior.com to hold your spot!